Well, the day is finally here. After speculation, announcements, and years of play-testing, the 5th Edition of Dungeons and Dragons has finally arrived as a hardcover book, with the release of the Player’s Handbook. We finally have in our hands “Everything a player needs to create heroic characters for the world’s greatest roleplaying game.” And you know what? It is a beautiful book, with artwork so evocative and elegant, it graces each page it’s on. It’s a book that can sit proudly on a shelf next to your favorite edition of the game as part of the tapestry of DnD. So lets take a look at what’s inside in Part One of the book. The cover by Tyler Jacobson depicts the fire giant King Snurre taking care of some unwelcome visitors. 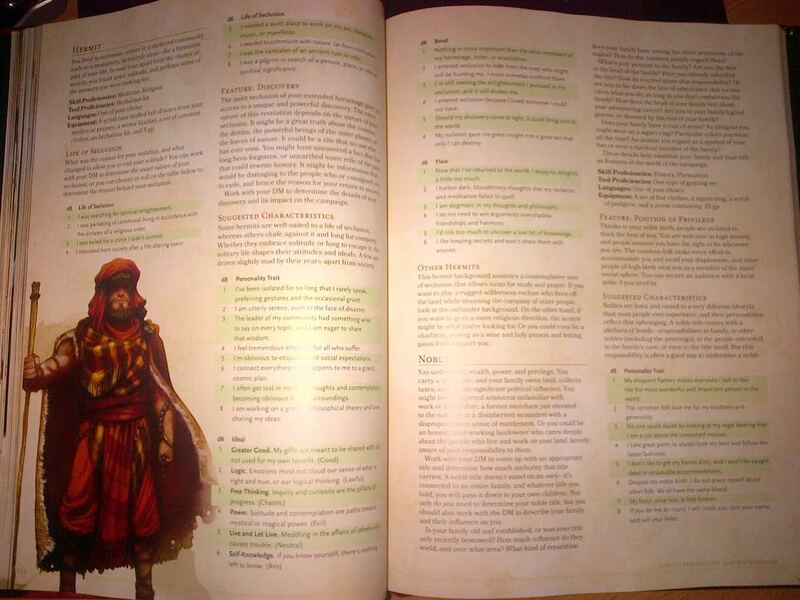 The 5th Edition Player’s Handbook packs 317 pages of content (and we’ve seen a lot of it in the Basic PDF). There are nine chapters, and five appendixes. There is also a four page index and a character sheet. A “What’s Next?” ad rounds out the book, basically promoting the Dungeon Master’s Guide, Monster Manual, and Encounters events. The layout is clear and easy on the eyes. The contrast works, the headers stand out with their red colored letters and the font is clear. One thing that needs to be talked about before we even touch the actual content is the artwork. It is gorgeous. It’s evocative, fresh, diverse, inclusive, and flavorful. The artwork in this book is fantastic, and in my opinion is leaps and bounds over 4th Edition artwork. While my favorite stuff is still my nostalgia driven rose colored glasses work of Easley and Elmore, this art created by 62 credited interior artists, sets a new standard for D&D. Producer Greg Bilsland told me via twitter that the art and graphic design was one of his favorite parts of this book, and I can see why. 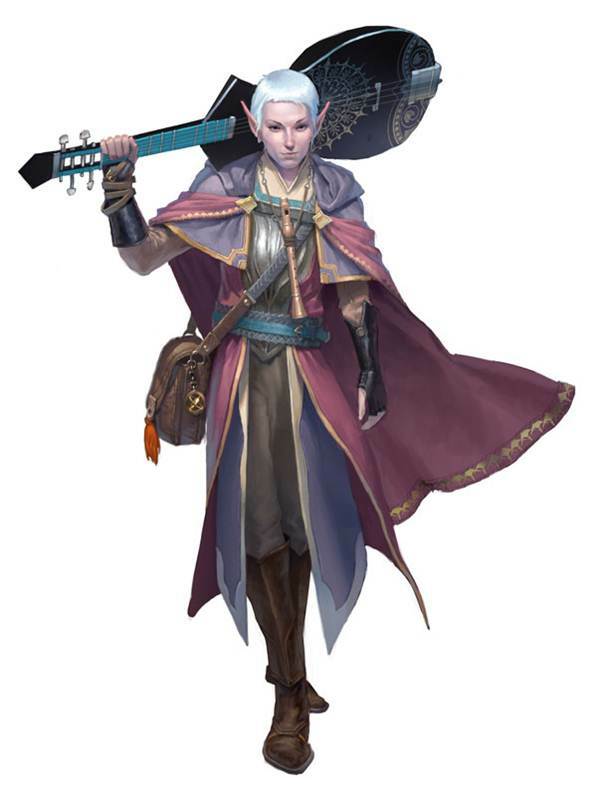 The 5e Bard, ready to strum the guitar and send you to hell. The book opens with a preface by Mike Mearls, and its basic gist is about how special D&D is in creating friendship, memories, and building confidence to go on and be creative. It is a nice piece, and I appreciate that the book has one. It didn’t fall into the trap of mentioning other editions, or why this edition exists, etc… No. It’s all about D&D’s strengths and uniqueness. It’s a solid preface. Next we get a formal introduction to the book, with a short play example and the typical “what is roleplaying” type stuff. We’ve seen this before, and we’ll one day see it again. 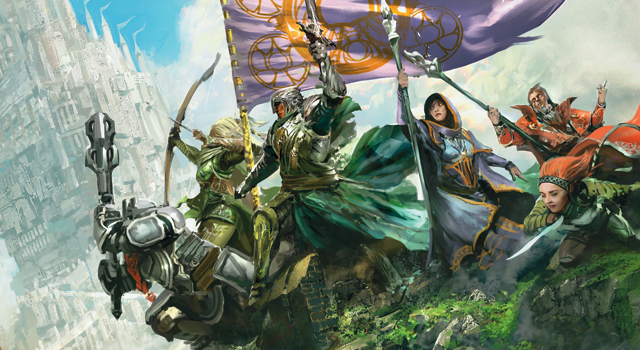 Nothing new here, except maybe the parts where it hilites some of the new rules of 5th Edition like Advantage/Disadvantage, and mentions the three pillars of adventure: Exploration, Social Interaction, and Combat. I suspect that order was deliberate… We then get into part one of the book, Creating a Character. Part one opens with a full color splash page piece of art we’ve seen before, as the cover to the “Gencon Exclusive” D&D Next adventure “Ghosts of Dragonspear Castle”. So yeah, it’s recycled art… kind of… but it’s good recycled art. important terms are in bold as to attract attention. It’s a short chapter, only 5 pages, but it puts forth the concepts of character creation effectively. If you’re familiar with the Basic PDF then you know what this chapter looks like, albeit with more races and artwork thrown in. A total of 9 races are featured in this chapter, and it makes a point to single out Dwarf, Elf, Halflings, and Humans as the most common races, with Humans being the most common of all. Each class gets its write up, some artwork, its advancement table, features, and different class options a player can pick from. Again, it is worth singling out the artwork here, each class is represented with flavorful artwork that is sure to inspire. Different ethnicities are well represented too. This is a short chapter, just 5 pages, where you’ll find charts for height and weight, languages, background (13), alignment (nine like the old days), etc. A neat thing… sample alphabets for the Draconic, Elvish, and Dwarvish scripts. It would be great if WOTC released these as fonts for DMs to make handout with, props, etc. 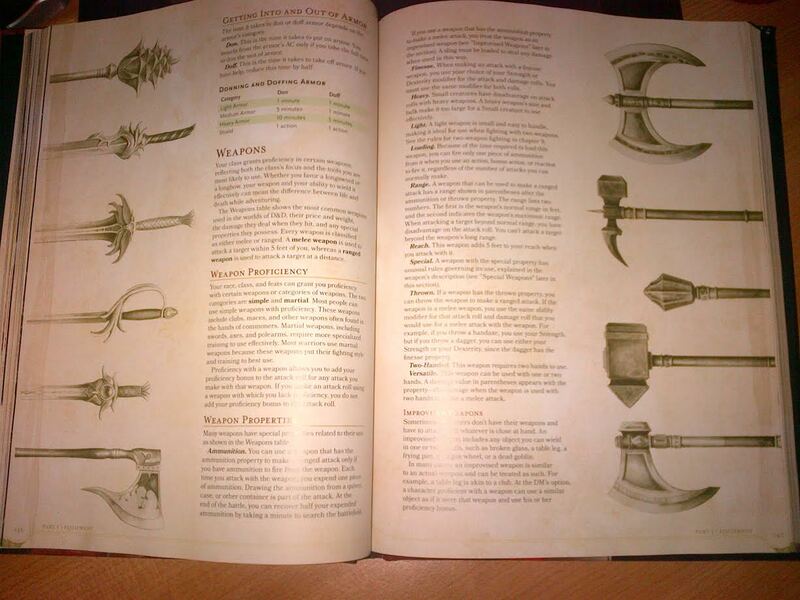 The equipment chapter covers obviously all the gear needed for adventure, including weapon and armor, tools, gear, mounts, vehicles, etc. Charts include container capacity, time to don and doff armor, coinage exchange rates, and starting wealth by class. There are others, like weapon and armor costs. The art is really good here, but I wish I saw each weapon and armor identified like I think we’ve had in previous versions of the game. Coins take on various shapes and aren’t limited to just being round, for example a gold coin is anvil shaped and a silver coin is a triangle. 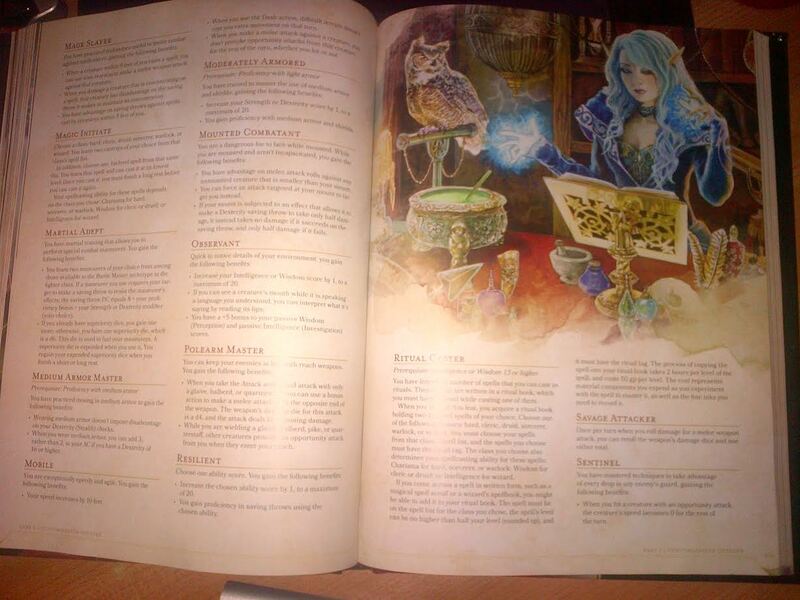 The chapter is rounded out with the “100 trinkets” chart found in the Basic PDF. 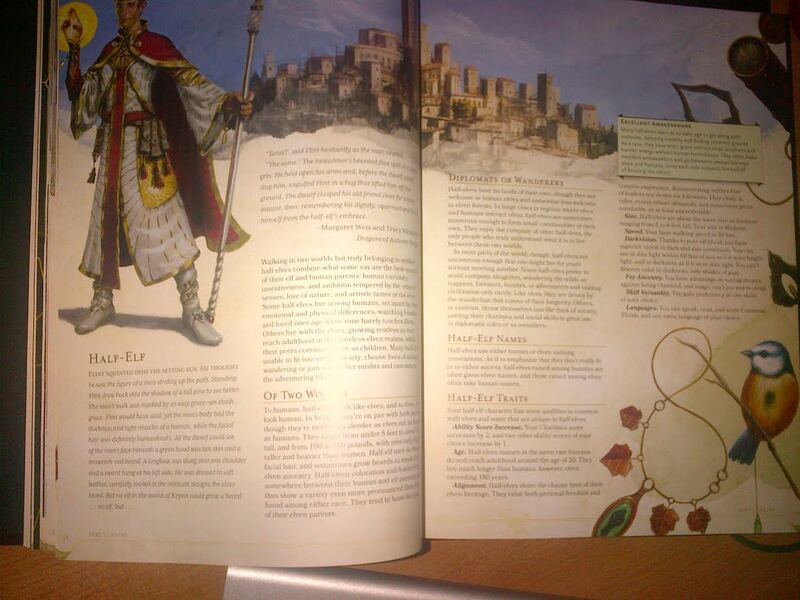 The last chapter in Part One has rules for multiclassing and feats. There are 42 feats in the game, and some of those I wouldn’t think twice about getting, like the Spell Sniper if I were playing a Wizard. It doubles the range of any spell I would have to roll for and it ignores half or three-quarters cover. This is a short chapter, leading us into Part Two of the PHB… which I’ll get to later. So, my thoughts on this book? I really, really like it. It’s D&D, first and foremost. If the goal was to create a new game that hit certain buttons and from the game’s 40-year history, well, they’ve succeeded. 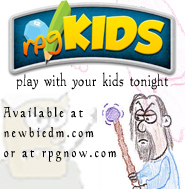 The artwork is perhaps a bit of a deviation from what we’ve been used to in D&D. It has a different type of look from some of the things we’ve seen before, a lot of paintings, a lot more non-traditional fantasy types perhaps, but it’s good. A high point. There is a lot of that Basic PDF in here too. When they said they were giving us the game for free, they meant it. This book really expands on what the PDF made available. If you’re sitting on the fence over 5e, try the PDF first. In fact, WOTC released a supplement today for Hoard of the Dragon Queen for free, and it includes monsters and magic items. You can certainly play the 5e experience for free before you commit to this book’s $50.00 price point. Although I suspect if you enjoy what you see in the PDF, you’ll want this gorgeous book. It may just be one of my favorite D&D Player Handbooks yet. It is that pretty. I’ll take a look at Part 2 later. 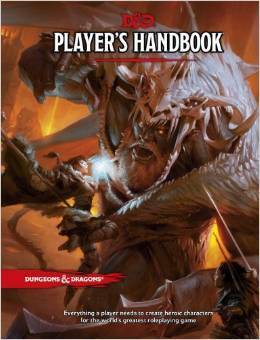 ← Win a 5e Player’s Handbook! 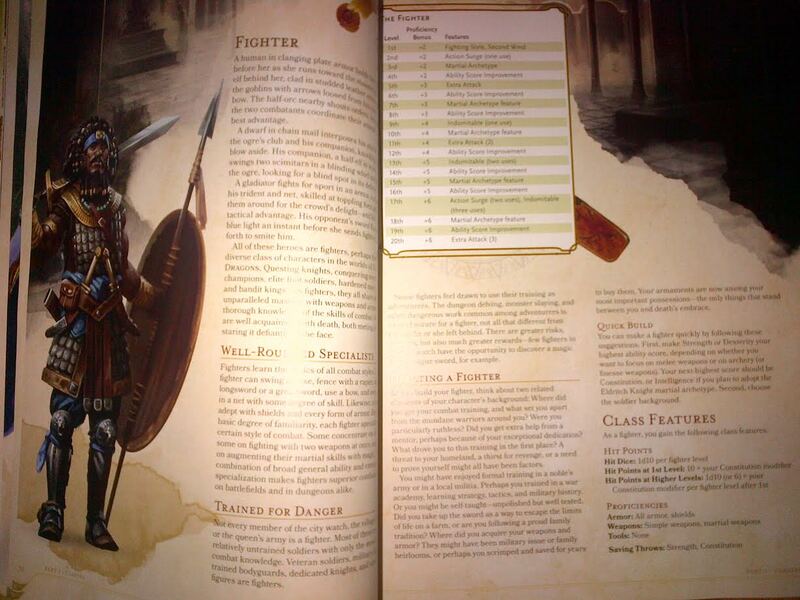 Thanks for the look into P1 of the PHB, love your blog and gearing up for my first ever campaign as a DM in next couple of weeks with new players. Thinking of making a blog to track the adventure. Thanks for all the DM tips and look forward to reading more from you. Dethek is the name of the Dwarven font and Espruar the elven one.